It is very important for the body’s pH balance to be right. The ideal pH of the body is 7.365- 7.369. A reading any lower than this indicates acidosis. The symptoms of acidosis are wide and varied. They include lack of energy, fatigue, poor circulation, weight gain (or loss), irritability, nervousness, depression, inflammation, gastrointestinal disorders, reflux, diabetes, irregular bowel movements, joint fatigue, arthritis, rheumatism, gout, acne, eczema, psoriasis, bad breath and low libido. This list is not complete but it gives you an idea of the damaging effects that occur from an acidic body. What causes the body to become acidic? Meat (in excess), processed sugar, packaged foods, dairy (in excess), coffee and alcohol. Overloading the system with acids can overwhelm the body’s ability to become neutral. As the body becomes acidic as a result of ingesting acids, pathogens and microforms start to grow and proliferate. These microbes (yeasts, candida, anaerobic bacteria etc.. ) excrete acids and toxins into your system causing further pH imbalances. As the body becomes more and more acidic, its normal buffering system becomes depleted. Alkaline minerals become scarce and acids continue to build up, further contributing to the problem. What happens in the Urinary Ph test? On your visit to the clinic we may measure the Ph balance of your urine. This is a very simple and quick process, which gives us a clear reading of the acidity of your system. 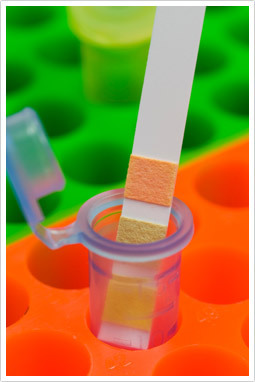 The test involves dipping a test strip into a urine sample for a few seconds. Then the test strip is compared to a colour chart to give us a reading. What can the Naturopaths at the Melbourne Natural Medicine Clinic (MNMC) do to reduce the acidity in my body? After a thorough consultation and assessment of your Urinary pH test, your Naturopath will set you up on a program to reduce your overall acidity and bring your body back into balance.